Dirty Tangible Interfaces (DIRTI) offer a playful, interactive, sonorous and visual journey for people ages two and up. Through manipulations and listening, sight and hearing is solicited. 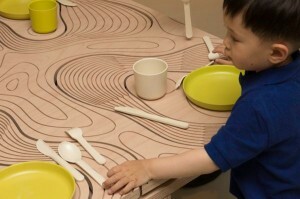 When children sink their hands in different materials that fill interactive tubs they set off sounds and images. DIRTI is designed by User Studio/Matthieu Savary with audio and interaction development by Diemo Schwarz and Norbert Schnell, ISMM team, Ircam-STMS. 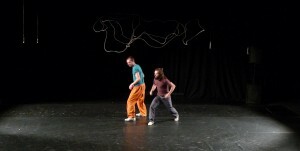 Composition by Ariadna Alsina and Emmanuelle Lizère. 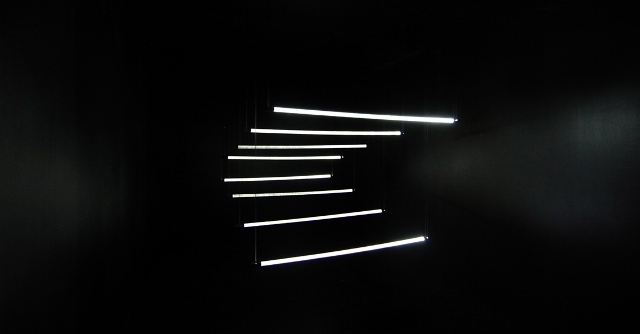 Le son au bout des doigts is an installation shown 1.6.–18.6. at the Centre Pompidou and part of Ircam’s Manifeste festival. With DIRTI developed by User Studio/Matthieu Savary, when children sink their hands in different materials that fill interactive tubs they set off sounds and images. For Topo-Phonie café I developed a new interaction method with a table, based on gesture recognition technology by the ISMM team and contact interaction. For the Dirty Tangible Interfaces (DIRTI), I ported the sound engine to a Linux SBC and adapted the Mac software for the quadrophonic DIRTI XL. See this article on France Musique for an appreciation. On show on the 3rd basement floor of a former parking garage to be demolished, together with 20 works of street art and other digital art by Collectif RYBN, Grafitti Research Lab, Stéphane Degoutin et Gwenola Wagon, Benjamin Gaulon, Matthieu Kavyrchine, Nicolas Maigret et Maria Roszkowska, Edouard Sufrin. 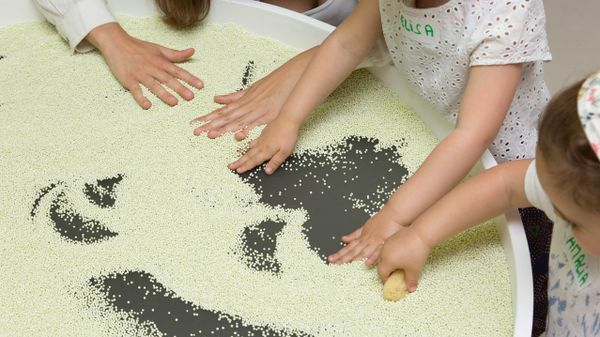 Create music and graphic animation with expressive gestures, mold sonic landscapes by plowing through tapioca beads with the Dirty Tangible Interfaces! New Academic Building, 1st floor Mezzanine, Goldsmiths, University of London. Presented by New Adventures in Sound Art (NAISA) in partnership with the Consulate General of France in Toronto. DIRTI for iPad nominated for IxDA awards, public voting open! 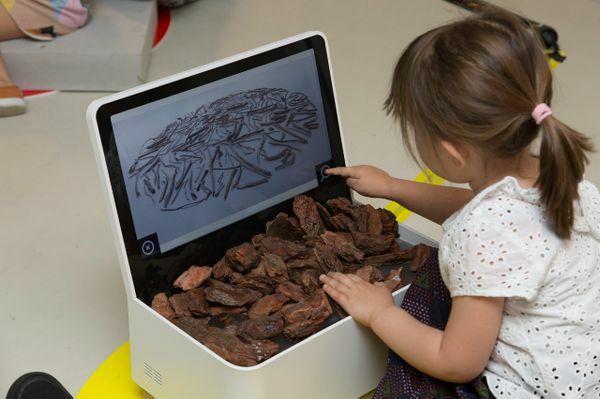 DIRTI for iPad, the world’s first tapioca interface, lets young children control an audiovisual experience by playing with a bowl of tapioca. 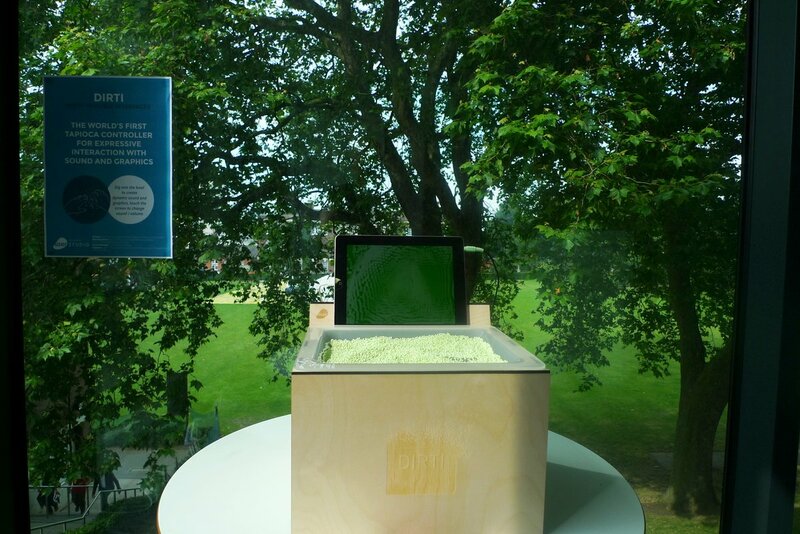 The project has been nominated for the prestigious IxDA interaction design awards, and the people’s choice award is now open for voting by going to http://awards.ixda.org/entry/2014/dirti-for-ipad/vote. 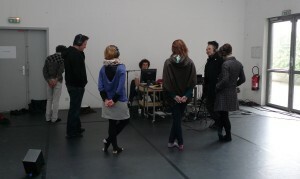 Franck Leibovici & Diemo Schwarz present a sound installation derived from the PANDA mini-opera for non-musicians as part of the show ISLAND at the Dairy Art Centre, London. Ai Weiwei, John Armleder, Sylvie Auvray, Tom Benson, Valentin Carron, Jake and Dinos Chapman, George Condo, Ann Craven, Thomas Demand, Fang Lijun, Urs Fischer, Théodore Fivel, Sylvie Fleury, FOS, Cyprien Gaillard, Gunjan Gupta, Anthea Hamilton, Thilo Heinzmann, Terence Koh, Sergej Jensen, Rashid Johnson, Per Kirkeby, Adriana Lara, Franck Leibovici & Diemo Schwarz, Ursula Mayer, Takashi Murakami, Order of the Third Bird, Jagannath Panda, Mai-Thu Perret, Sigmar Polke, Laure Prouvost, R.H. Quaytman, Ugo Rondinone, Sterling Ruby, Tomàs Saraceno, Julian Schnabel, Cindy Sherman, Dirk Skreber, Haim Steinbach, Rirkrit Tiravanija, Thukral and Tagra, Andro Wekua, Douglas White, Zeng Fanzhi. Dirty Tangible Interfaces (DIRTI) are a new concept in interaction design that forgoes the dogma of repeatability in favor of a richer and more complex experience, constantly evolving, irreversible & infinitely modifiable. The video resuming 4 days of experimentation with a tangible interface and iPad app specially designed for kids at the Maison des Petits of the cultural centre CENTQUATRE in Paris is now online. 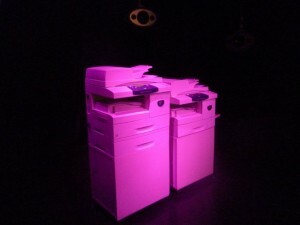 A la suite de sa résidence de création au Cube, Christian Delécluse présente au public Inner Space, sa dernière installation numérique coproduite par Le Cube et Arcadi. 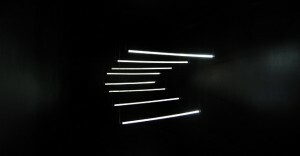 Inner Space est une installation lumineuse et sonore qui interroge les processus de construction de nos perceptions à travers la constitution d’espaces sensibles en perpétuelle transformation, à l’intérieur d’un vaste volume de la taille d’une chambre à coucher standard (12 m²). Frédéric Blondy, Diemo Schwarz (original live music), Marguerite Lantz, Françoise Tartinville (scenography), Fabien Almakiewicz, Cyril Geeroms (dance), Boris Molinié (lights). 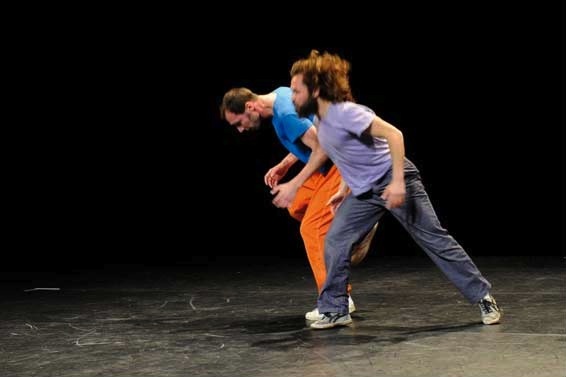 World premiere of Intérieur Crème, Acte II: Blanc Brut by choreographer Françoise Tartinville, Cie. Atmen, live music by Frédéric Blondy and Diemo Schwarz, at the Etoile du Nord theatre. With Marguerite Lantz, Françoise Tartinville (scenography), Fabien Almakiewicz, Cyril Geeroms (dance), Boris Molinié (lights). See the interview with choreographer Françoise Tartinville on Blanc Brut. Blanc Brut, deuxième volet d’Intérieur Crème, est une approche du masculin – considéré dans son volume, sa matière, ses aspérités – sous l’angle d’un regard féminin. Deux « physicalités » se déploient sur scène : deux forces, qui tantôt s’assemblent, formant une même entité organique mouvante et multiple, et qui tantôt se partagent en deux entités à la fois opposées mais interdépendantes. Il s’agit d’explorer les ressorts pulsionnels des corps, le mouvement brut, puissant, charnel et instinctif et d’en suivre les flux, les trajectoires communes, les architectures imaginaires. Les mouvements sont abrupts puis s’enroulent, se répandent pour s’épuiser jusqu’à l’étourdissement, laissant émerger les états intérieurs du danseur. 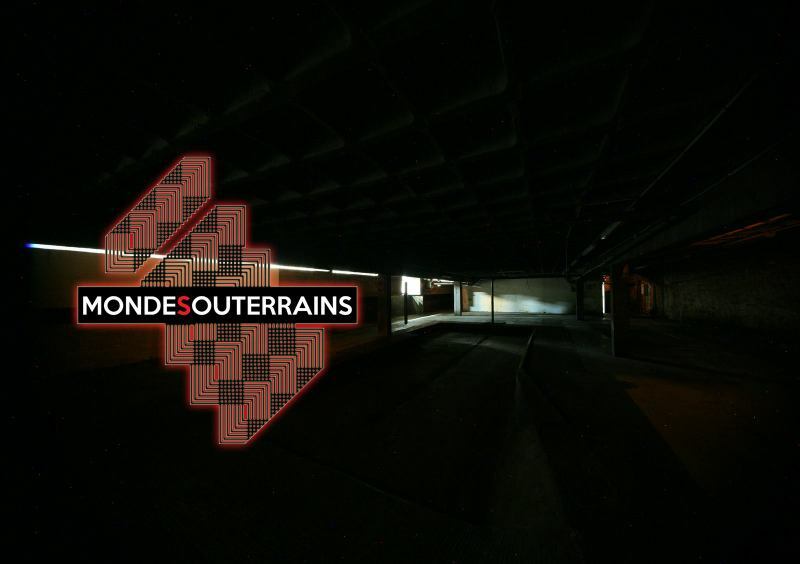 Interactive sound and video installation with Ianis Lallemand, in the former collider ring ACO Science at Orsay University south of Paris, within the Art-Science days of the festival Printemps de la Culture, May 23–24. See here photos of the fascinating site still ringing with a rich scientific history. Dirty Tangible Interfaces are a new concept in interaction design that forgoes the dogma of repeatability in favor of a richer and more complex experience, constantly evolving, irreversible & infinitely modifiable. Diemo Schwarz. Developed within the Topophonie project. Les turbulents, c’est un accompagnement de 3 jeunes chorégraphes que l’équipe de L’étoile du nord, en partenariat avec Arcadi, va suivre tout au long de la saison. Nous vous proposons de découvrir le processus de création de ces trois projets chorégraphiques dans une version en cours de fabrication ou terminée. Nous clôturerons ce programme avec le parrain de cette soirée, le chorégraphe Frédéric Werlé. 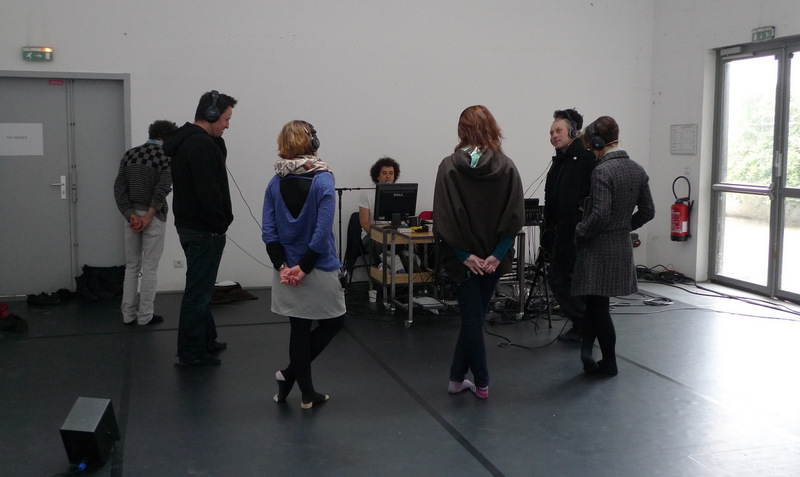 Production version of the Collaborative sound installation Grainstick, originally developed by the IMTR and room acoustics team at Ircam, and the composer Pierre Jodlowski, for the EU project SAME, using the “Rainstick” instrument gestural control metaphor. 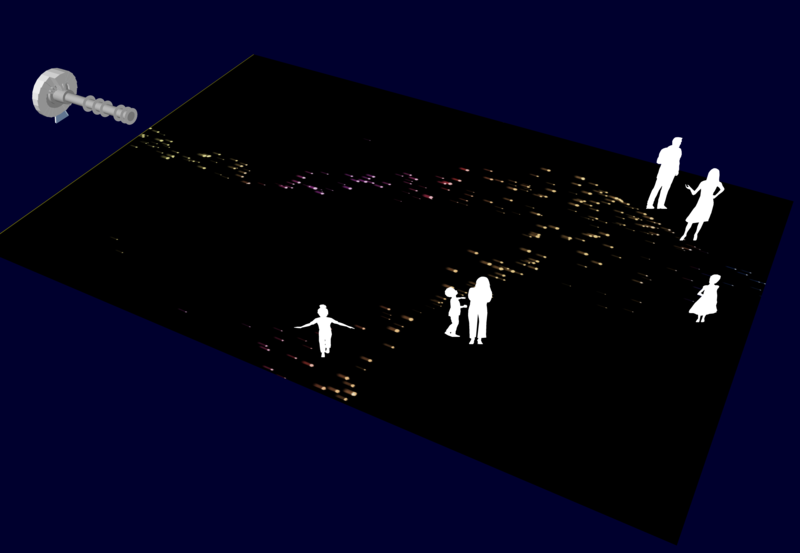 Applied technologies: WFS spatialisation, motion tracking, gesture analysis, corpus-based synthesis. First prototype presented at the Agora Festival 2009. Real-Time Musical Interactions: Frédéric Bevilacqua, Emmanuel Fléty, Diemo Schwarz, Bruno Zamborlin.